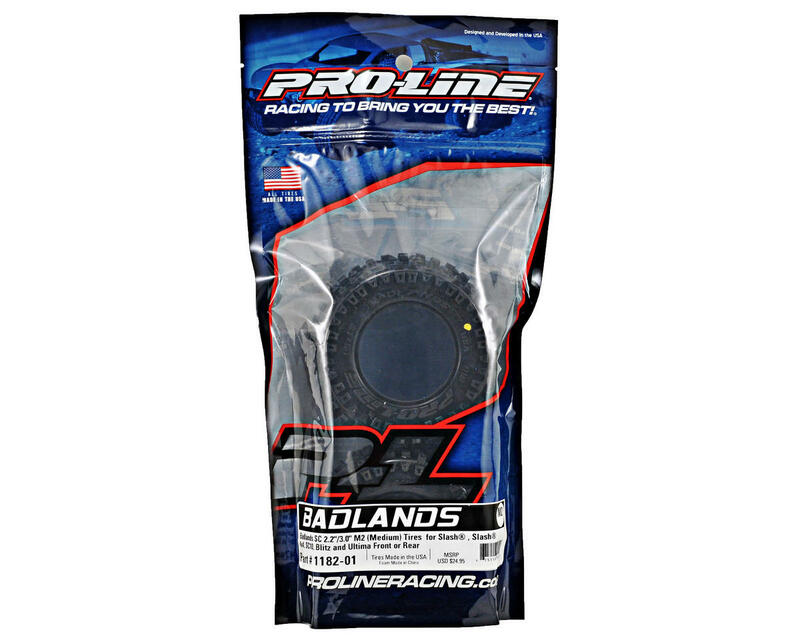 This is a set of two Pro-Line Badlands 2.0 SC 2.2"/3.0" Truck Tires, in M2 (Medium) compound. Are you ready to chew up the dirt and spit it out in a huge spray behind your SC truck? If so, then the Badlands SC tire is exactly the tire that you have been waiting for. The Badlands SC tire offers motocross style tread with huge, long-lasting lugs giving it the looks and performance that have won over bashers all across the globe. The Badlands tread design is made for the die-hard motocrosser in you. Its oversized grass and dirt shredding lugs offer you the ultimate in performance under all-terrain type conditions. The lugs are designed to ensure longevity while spitting up the surface below. Made from soft yet durable M2 compound, the Badlands tire is poised for battle and ready to take your Short Course Truck to the next level of bashing heaven. Get a set of Badlands SC tires for your Short Course truck today! Amazing forward traction and the right amount of side bite to keep your 2wd from getting sideways but doesn't grab the ruts. Reminds me of the old "evil twin" tire with lugs slightly larger than that of the Holeshot. I run mostly on eastcoast clay tracks but if you need that little bit of extra forward drive, this is the tire for you! When my homemade track gets dry, dusty and deep with some hardpack these tires charge through and keep the forward momentum going. I run mine with no air holes to keep the fine dust out. These are the best tires I've tried on a short course, they have great traction on nearly any kind of surface. They are definitely better than the Trenchers and with the extra width they definitely grip and look better. This is one of the best tires I've owned by far. They've been good on everything I've thrown at them carpet, grass, sand, loose dirt, blue grooved, and clay. Awesome tire, way to go Pro-line!! Great tire!! High performance!! Very durable!! Congratulations proline!! 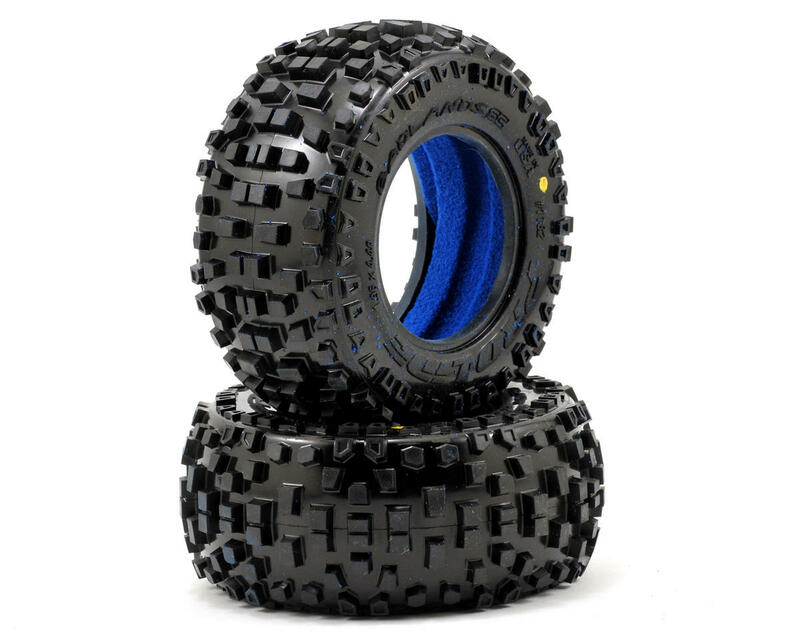 Just put these on my Slash Raptor, Excellent replacement for the stock tires the off road traction is like night and day, I'm ordering more! Had only seen these used once during 2wd SC heats on an outdoor dirt track, needless to say the kid running on them dominated the field. Since getting them I have only ran some practice laps and love the grip, perfect bite when you expect it. Great advantage over competition. Gravel-Short Grass-Mud-Asphault-Concrete-Carpet-Mulch-Everything yeah even sand as long as its not super soft sand, and you will be amazed by the Badlands by Pro-Line. The wear is great. couldnt ask for much more. Need I mention how cool they look...? BUY THEM!! !